The interior of our office is painted in an array of bright colors. Although I've always felt this looked ridiculously Mexican restaurant-ish, the argument can be made that it is supposed to be a creative and "happy" space for conducting the business of making boring things less boring, as we do at my company. Fine. But the exterior, really? I've been told by others that the logic was to increase the visibility from the road, since there is a curtain of trees around three sides of the place. Or that this particular color fits in with the Mediterranean feel of the building's architecture. I'm not exactly buying either of these. It could also be said that the place has sort of a beach house feel to it, which is relaxing. (Although I've yet to feel like I'm at the beach while inide.) Taco Bueno-esque seems to be the best theory. Or at least the tastiest. Nonetheless, I've been telling myself that this would just take some getting used to. It's been about a week and my eyeballs still feel assaulted when I pull up in the morning. I'm giving this whole situation a hearty "WTF" and trying to move on. So far, I just can't get over this ridiculousness. Wonder if we'll have burritos for lunch on Friday? I love it. Your office looks much cozier than my 80 gazillion floor mirrored monster. 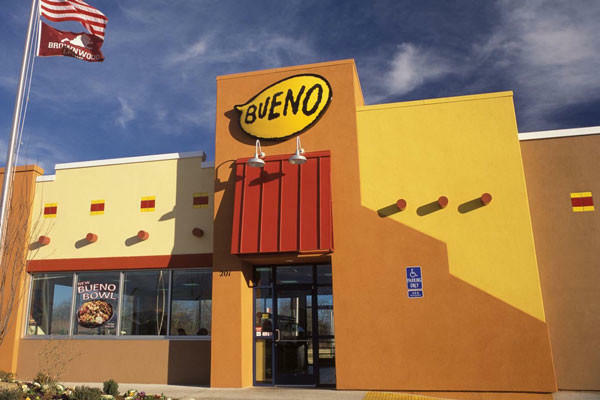 Also, FACT: I've lived in Dallas about 2 years and never been to the Bueno. I've been told (by a very reliable fast food connoisseur) the thing about Taco Bueno is there is always something better next door... And there is. Long live Taco C! That's a cute building. I think the new paint makes it very California. Other Casey: Long live Taco C indeed!